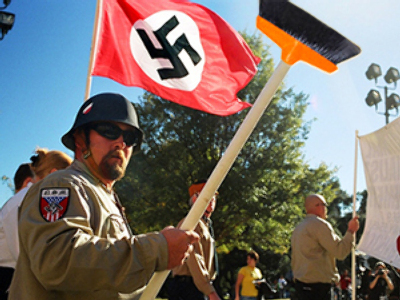 A Neo-Nazi group in the US has joined a highway clean-up program in the state of Missouri. A controversial free-speech court victory by the Ku Klux Klan four years ago cleared the way for their participation. The Springfield chapter of the National Socialist Movement joined the state of Missouri's 'Adopt-A-Highway' volunteer litter program and will be responsible for picking up trash along a half-mile section of the highway near Springfield. Four years ago the white supremacist Ku Klux Klan won a U.S. Supreme Court decision opening up participation in the trash clean-up program. The Court's decision read that a group's membership cannot be based on its political beliefs. As part of the program, two signs are posted on each end of the highway acknowledging the highway 'adopter'. In 2005, the American Nazi Party had adopted a stretch of road in Salem, the Oregon state capital. Two signs, which bore the name 'American Nazi Party', were put up. The signs, paid for by tax-payers, were vandalised and promptly taken down. Lawyers fighting the Ku Klux Klan ruling in the Supreme Court said that allowing the Neo-Nazi group to join the program, as well allowing them to post their name on a sign, would send a message of acknowledgement and acceptance of the movement. However, the court along with the American Civil Liberties Union saw it differently, allowing the Springfield group to join the litter scheme unhindered. “It's a First Amendment thing, and we can't discriminate as long as they pick up the trash,” said Bob Edwards, a spokesman for Springfield's transportation department.